Thanks for stopping by my blog. This is a place where I can post photographs of my work and add to the online conversation and visual repertoire of the Internet. I am currently located in Utah, though my studies have taken me as far as Europe. Please take a look at my portfolio pages (below, or on the right-hand column) and at my blog. I am currently available for conservation and custom binding commissions. 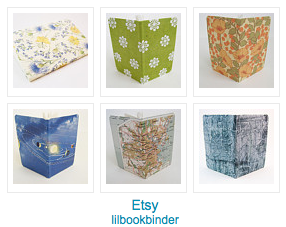 Questions about my work can be sent to lilbookbinder [at] gmail [dot] com. Thanks for the comment on my blog. i love your book work too. I really enjoyed that class. I have three more books in min that I’m going to be making soon. Have a good one. I, too, followed your link on the Book_Arts-L listserv. Thanks for posting it– your blog is a feast for the eye and I’m looking forward to exploring every page. What an amazing collection of work! I am new to bookbinding so could you please give some examples of the type of paper and weight you are using for the book covers & the spine themselves? When I google bookbinding paper etc I only find places that sell them and not info on the type used. My concern is that if I use typical printer papaer (marbled by hand) the paper will eventually bubble or easily rip. Thanks for any advice you can offer. Amazing work. I teach bookbinding at the Portfolio Center in Atlanta GA. I’ll tell my students to check out your work. It is inspiring. Where did you receive your BFA and training? Do you think you’ll make it to Telluride this year? I’ll call soon to catch up. Hope you are well!! I can’t get through to you on email. Will you contact me? It’s Judy from the American Academy of Bookbinding. I love your site! I need some advice on an AAB blog, and I want you to correct the link on your site to us (it is the wrong address.) Anyway, hope you are well. Looking forward to hearing from you! Lili, I love your blog: it’s amazing, so interesting, and your books are beautiful. Congratulations, and many thanks to share your work! I have a few questions about book binding! – if you wouldn’t mind dropping me an email that would be great! Amazing work!! I was wondering if you could help me… I have a book that the first and last pages have humidity. Is there a way to fix it??? Could you please tell me what can i do?? I apologize for the errors, the translator of google. We are your colleagues who are also engaged in manufacturing of binders, but almost exclusively from natural leather. Technology we have only the more modern, medium and large runs. But we can and make a classic cover. We had a request for production is not for standard folders for a restaurant in New York, we were told that they could not find in the U.S. who would have done to them, all offer only standard products, without imagination, and the retreat of their products worked technologies. And now, a beautiful woman, beautiful work. How unlucky customer that he did not find you. If you do not mind I’ll take on arms nekotrye ideas? Hi Lili, lovely work! A very interesting blog. I’m a hand marbler based in Wiltshire in the UK. A wonderful blog. I appreciated your description of paste papers. Hello! I am actually interested in getting a quantity of books made in Coptic stitch fashion. The quantities at first would run around a hundred books. I can provide the papers, but I have no one to actually assemble the book. The book is sort of a study of “primitive art history” so the Coptic stitch would be awesome. Can you help me find someone that can bind these for more? I am willing to pay to make it worth their time. I have had a terrible time in finding a Coptic stitch “publisher” and hope that you or someone you may know can help. I hope you don’t mind me contacting you, my name is Paul Thomson, I am a recently retired bookbinder with some 40 years experience. In my past I have worked for ‘commercial’ binderies/factories and also a few years in antique book restoration. However, for the most part of my career my focus was on bespoke bookbinding projects for private clients – A job I enjoyed very much. The past few months, my Grandson and I have been working on a small website called iBookBinding (http://www.ibookbinding.com). Through this website we hope to pass some of my (sometimes questionable) knowledge onto others who might be interested in starting down a similar career path or simply those with an interest in the book arts. I take a great deal of time to write each post and ensure that it provides the most comprehensive information possible without any ‘waffle’. My Grandson also works very hard in converting my sketches into digital images for use in the tutorials, to which I think he does an excellent job. If you have a spare minute, would you mind taking the time to review our site and consider us for inclusion as a resource within your ‘Blogroll’ section on https://lilbookbinder.wordpress.com/? I believe our site would be a valuable resource for your website’s visitors and I would be grateful for any assistance you could offer in helping to spread the word; I would be delighted to know that our efforts are not going to waste and that there are at least a handful of people out there that are benefiting from our work. I am updating the website on a weekly basis and will continue for the next few years or for as long as I am physically able to so do; I hope it will provide useful information to those who require it long into the future. Apologies if I am approaching you in an unfamiliar fashion, my Grandson has instructed me to make contact with sites that I use often and find useful and ask for some help and feedback, you are on my bookmarks and are one of the very first sites I am contacting. Future correspondence I’m sure will be more honed. Please continue the good work on your website, I drop by regularly and often use your site as a resource when writing posts of my own. I have only recently began to appreciate the time it takes to write a decent post for a website, I commend you on the work you’ve done for your site, thank you.